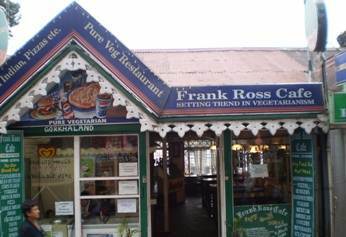 Frank Ross Cafe is a vegetarian cafe style eatery located on Nehru Road and on the way to the Mall. Don't expect regular restaurant meals here. They essentially serve snack type items, but of good varieties and different cuisine. The cafe is run by a family that also owns the adjacent Frank Ross Pharmacy. While the father manages the original business of the pharmacy, the son runs the cafe. 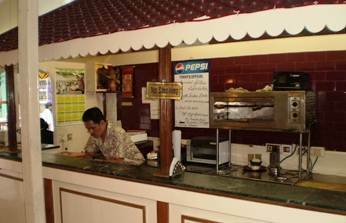 Other than Indian and South Indian items, the cafe also offers Mexican, Italian, and Chinese snack items. If you are looking for vegetarian breakfast, or a quick lunch or even early dinner near the Mall area, then this can be a good option. As you enter the restaurant from Nehru Road, there are few tables arranged in rows on the right and have green marble tops on cane stands. The high cane chairs have green cushions and look typically like bar stools. On the left there is an open kitchen and a counter. With hanging lamps and framed pictures on the right wall, the overall ambience in this small restaurant is quite impressive. There is another small section at the end where there are only two tables laid out. These tables have wonderful view of the mountains. There is also a wash basin there and a small kitchenette. So what kind of food do you get at the Frank Ross Cafe? Let's start from the breakfast. You can have several choices including club sandwiches, beans on toast, corn flakes, porridge, French fries, pizzas, garlic bread, dosas, enchiladas, tacos, nachos, momos, pau bhaji, chola batura, tea and coffee. You see that even in breakfast, there are several International cuisine served other than South Indian and Indian dishes. When I asked the man at the counter about specialty dishes in the cafe, he said they prepare South Indian dishes really well. The dosas were actually quite nice. Italian: Different types of vegetarian pizzas including cheese and spicy pizzas, cheese chilly toast, garlic bread, spaghetti with tomato sauce, sizzlers etc. Indian Snacks: Mixed chat, grilled sandwich, chola batura, pau bhaji, chana tikka, phuchka (pani puri), aloo paratha with curd & pickles, momos, papri & other chats, pakora etc. They make nice vegetarian burgers as well. Chine Snacks: Fried rice, chowmein, manchurian, combo meal etc. South Indian: Different types of dosas, idly, vada, uttapam, pongal, and a combo (that includes a dosa, a vada and an idly). In beverages you will get Darjeeling and other types of tea, different types of coffee including cinnamon coffee, hot chocolate, hot milk etc. They keep cold drinks from Pepsi. There is a Kwality-Walls ice cream counter in front. So you will get ice creams here of different flavors. They also have take away service. So you can pack your food as well. Note that there is no toilet in the cafe. The high stool type chairs although mesh very nicely with the ambience, may not be very comfortable if you plan to sit here for long. The service is okay. The waiters are quite amateurish which is expected in a budget eatery like this. I often found it hard to carry on the conversation with the waiters here. Well that doesn't really matter. You are after all here to eat and not to talk. The restaurant serves breakfast and snacks. They accept credit cards. Frank Ross Cafe is located on Nehru Road that leads to the Mall. It's on the left of the road and the Mall is only a minute's walk from here. It's very close to the Glenary's Restaurant. 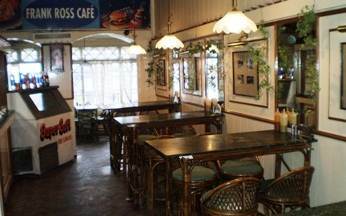 Frank Ross Cafe, 14 Nehru Road, Darjeeling.